How do you clean your screen, keyboard, etc? But for a PC 🖥️ monitor , I use alcohol wipe (after finding out that it is bad for glasses) for glasses 👓. and then wipe it off with a paper towel for PC monitor. For my laptop 💻, I use cloth for glasses 👓 as it's more delicate. For my keyboard, I turn it on its side and use canned air to blow debris out. If there's a tough to get at spot, I can remove the key and use rubbing alcohol + cotton swabs or microfiber cloths. Screen: I prefer dedicated screen or glass wipes. Joke is that it's a really cheap (~15$) keyboard which I've had for over 9 years now. Still works like a charm. The best way to clean them is buy the new screens and keyboards. Screen, /very/ slightly damp paper towel. Keyboard on desktop, it's bluetooth and I shut it off. Then I wring out a clorox wipe so it's only just damp. Then clean away. If anything is dripping or rolling with moisture it's too wet. For the keyboard I just tip it upside down and give it a few shakes to release any loose particles - dust, food crumbs etc. Occasionally when the computer is off I will give it a wipe with a slightly damp cloth. To clarify I have a desktop PC at home (not laptop). As for the screen usually a microfibre cloth, such as those I use to clean my glasses. Occasionally I will dampen the tip of my finger and use that to clean a spot on the monitor. Don't. Look. Under. Your. Mouse. They're usually black, so don't show the dirt. But I have a stupid USB vacuum cleaner my mother gave me as a joke which turned out to actually work, so that's good for crumbs when I've rammed an entire pack of biscuits (or crisps; I'm an equal opportunity snacker) into my mouth while coding. Sometimes I invert the keyboard and apply percussive cleansing techniques. My screens I clean with Windolene and a microfibre cloth once in a while. But every now and then I make the fatal mistake of looking at what the underside of my mouse has accumulated. What the hell is that stuff? No, don't answer that, I really don't want to know. 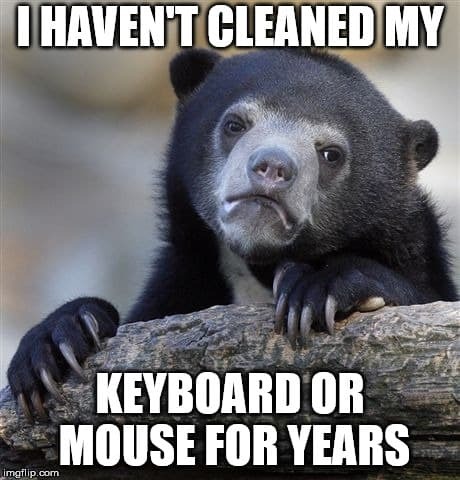 I am super particular about having a clean keyboard and table on which my computer is kept. I have a year old daughter who is always dropping all kinds of stuff in my keyboard, so I have kept a cleaning solution handy near my desktop. First thing which I do when I reach home and see that my computer or my table or my keyboard is empty is get cleaning. I was noticing that the screen on my Macbook was always getting fingerprints and smudges and no household remedies seemed to help, so I picked up some generic screen cleaner at Fry's and with a microfiber cloth that seems to do the trick. For the case, I usually use a (barely) damp microfiber cloth and just wipe the whole thing down. Though I haven't found a solution for cleaning laptop keyboards, so I'm interested to hear what people have come up with. Slightly damp micro-fibre cloth. I either use water or a mild alcohol solution. Little alcohol wipes, similar to those they pass out on airplanes, work great for screens and smudges on my keyboards. For my screen I've been using the same cleaner I use for my glasses, but with some skepticism, so I'm definitely reading these comments. I find a microfiber cloth with some water works on the screen + keyboard. Occasionally (like when I go to the plague-ridden office) I'll wipe the whole thing down with something antimicrobial.